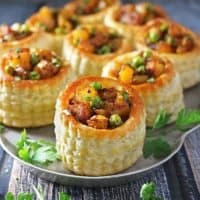 If you feel challenged when it comes to samosa folding like I do, then why not try making these Spiced Potato Puff Pastry Baskets or deconstructed samosas? When my daughter and I visit any South Asian Store, we head straight for the frozen food section to peruse the shelves for those packages of pre-made, oversized samosas. 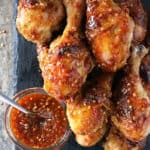 They are some of our favorite snacks for movie nights and for our appetizer night on New Year’s Eve, especially when paired with a nice, cold, glass bottle of Coca-Cola™ or Diet Coke®. My daughter loves those store bought samosas as they come enveloped in a nice crispy crust, while, I buy them as I have yet to perfect the art of samosa folding! At least that was prior to us moving. In this little college town that I currently live in, I have yet to visit a store that sells frozen samosas, so, I’ve started improvising. 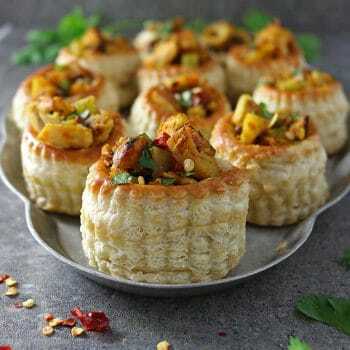 Instead of samosas enveloped in a crusty covering, I’ve started making “deconstructed samosas” in puff pastry baskets. 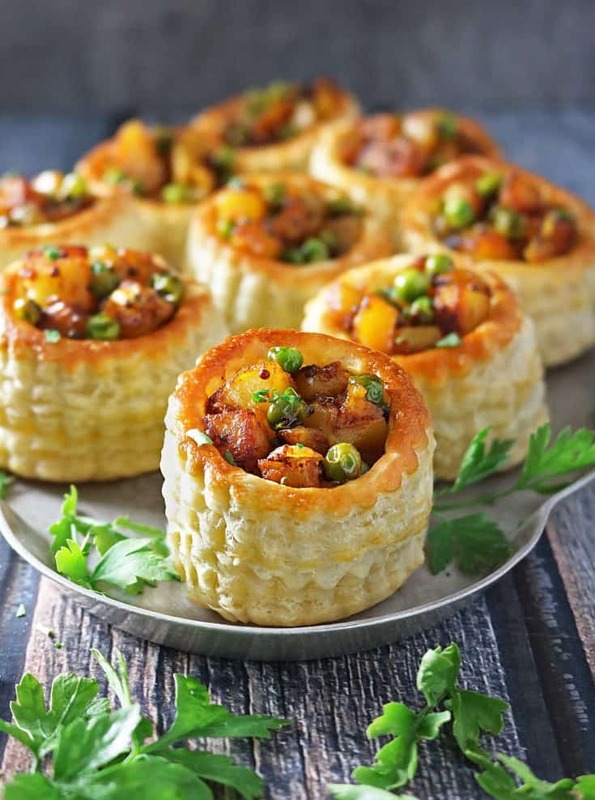 Now you can buy pre-made puff pastry baskets at just about any store. Or, you can make your own using puff pastry sheets. 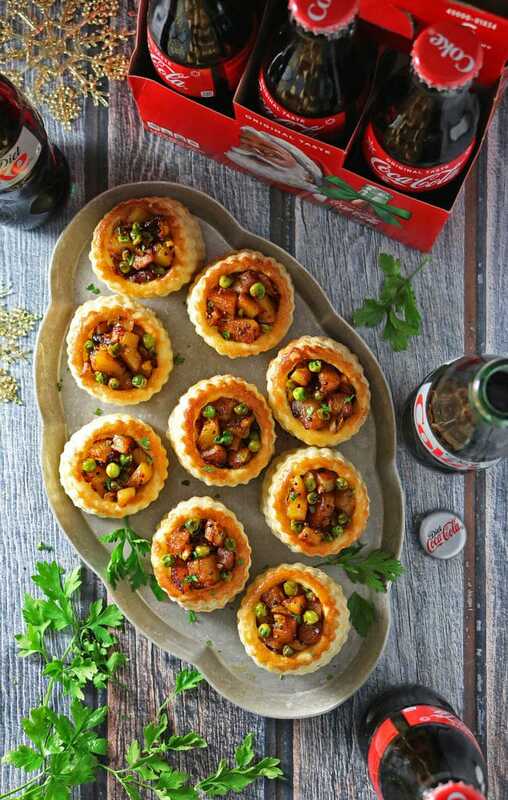 A friend told me that I should try drinking while I cooked, so I opened up a bottle of Diet Coke® to enjoy as I made these puff pastry baskets. 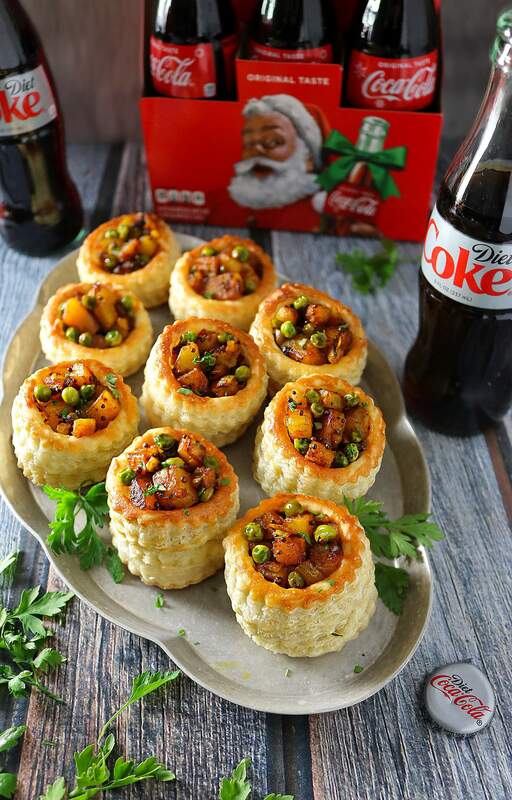 The flaky puff pastry along with the spiced potato and pea filling is delicious when washed down with a Coca-Cola™. Speaking of which, Coca-Cola™ and Diet Coke® always make an appearance on our holiday table. My daughter and mom especially love the perfectly sized, glass bottles. By the way, when I was growing up in Sri Lanka, the only bottles of Coca-Cola™ I had came in glass bottles. But, it’s not just during the holidays that we enjoy them. 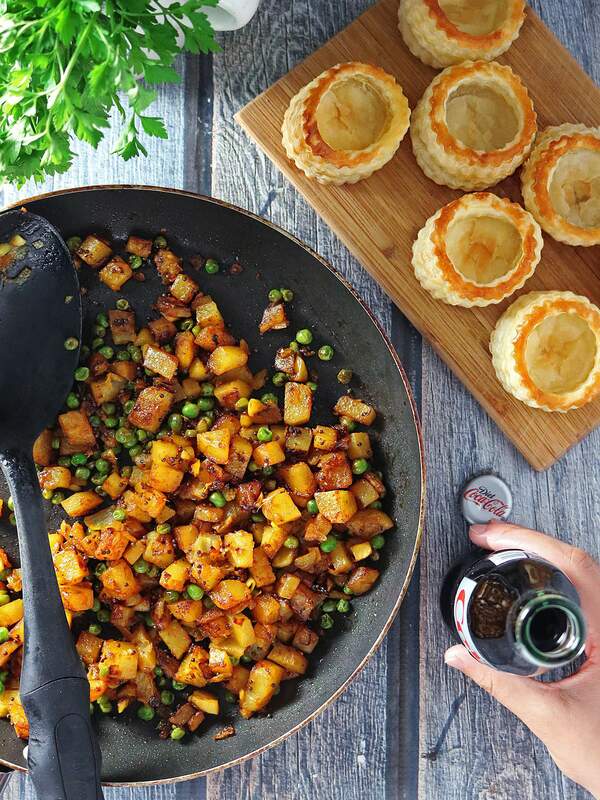 After a crazy week – we hang out and catch up on our favorite tv shows or watch a movie with some delicious snacks like these Spiced Potato Puff Pastry Baskets (AKA deconstructed samosas) and our favorite bottles of Coca-Cola™! 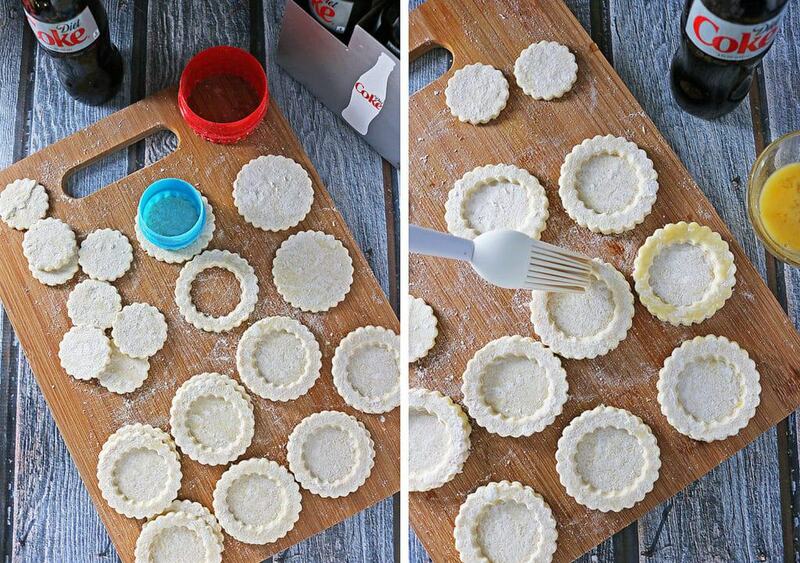 Grab two circular pastry cutters - one a little bit smaller than the other. Using the large one, cut out 9 circles in one of the puff pastry sheets. Then, using the same large pastry cutter, cut out nine large circles in the other pastry sheet as well. Then, using the smaller one, cut circles into the circles already cut out. Using a brush, brush some egg onto the bottom of the circle with a "hole" and place it on the larger circle. Repeat till you have nine circles on top of circles. Brush the tops with egg wash and bake at 400 degrees for 15 to 18 minutes. As these bake, they should rise up, forming baskets. As the baskets are baking, chop the onion and add to a pan with olive oil over medium heat. 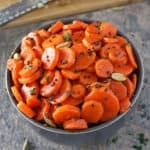 Then after 5-7 minutes, add in mustard seeds, chopped ginger and garlic as well as potatoes and lower heat to a low setting. 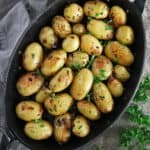 Cover potatoes and let cook about 10 minutes or till potato cubes are tender. Uncover and add in the peas, turmeric, smoked paprika, coriander, salt, pepper and saute a couple more minutes. 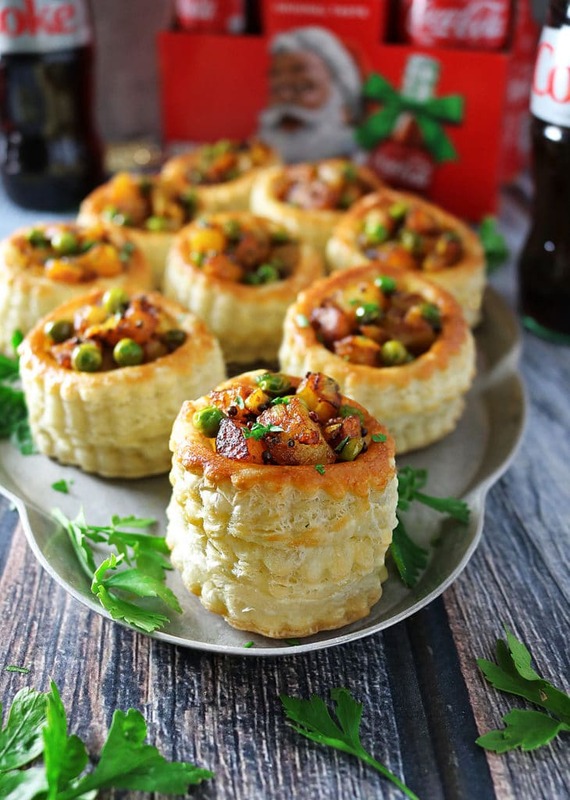 Add the spiced potato filling into the puff pastry baskets and garnish with parsley if desired and enjoy. A simple yet impressive appetizer! Love all the warming spices in the potato filling. Are you from Sri Lanka ? I miss Sei Lanka foods. Please post popular menus . I was assigned in Sr Lanka years ago as a United Nations Volunteer Nurse . Hi Lisa, yes, I was born there, but am in the States now. Sri Lanka sure is a beautiful country AND has some amazing food! 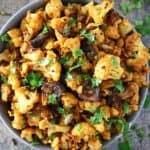 I do post a few fusion type Sri Lankan recipes from time to time – hard to find some of the spices used in those SL curries and stuff here 🙂 Thanks so much for stopping by. Must. Eat. Alladese. I mean seriously, they look kinda sorta incredible. Definitely need to try! YUMMMMMM. This looks great! I love using puff pastry! Beautiful presentation too! 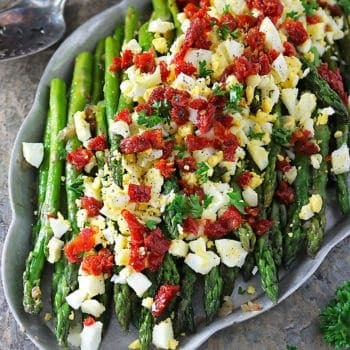 Hello, I love to make this dish for the Easter, can I make this way ahead and freeze it and put in in the oven on the day of the party? Please look forward to hear from you. 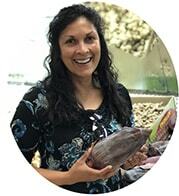 Hi Hema – I never froze these so I am not sure how well they would do. You can make the puff pastry baskets ahead and store in the refrigerator and bake them about 5 minutes to warm them up then stuff them with the mixture. Thanks so much for stopping by – I hope you do get to make these.